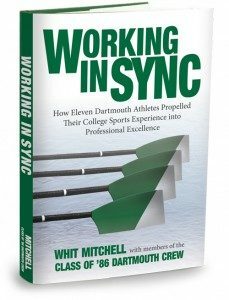 Working in Sync tells the stories of eleven former Dartmouth crew athletes who went on to lead exceptional lives. They all have one thing in common: Each credits part of his success to lessons learned during college crew under coach Whit Mitchell. After a 25th team reunion, Whit wanted to find out the secret to their successes. He conducted months of one-on-one interviews, uncovering outstanding insights on life, business, and success, and saw a direct connection to his executive coaching clients. In all eleven stories, the most important lesson is that success is achieved through working together—working in sync—with colleagues, clients, and loved ones. Read the stories of these eleven outstanding oarsmen, and learn how reciprocity leads to organizational success. Give copies to your team, and see the transformation trickle through your organization. Use the strategies in the book to become a more effective leader, mentor, spouse, and parent. Purchase a copy to begin your journey toward a more balanced, engaged, and in sync life. Are your ready to help your company and team be more effective? Do have a challenge that could use a fresh set of eyes or a new approach? Drop us a line. We are always happy to listen, ask some questions, and see if we might be able to help.